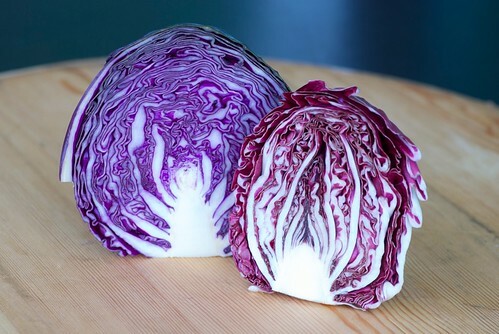 Food Blogga: What's the Difference Between Red Cabbage and Radicchio? What's the Difference Between Red Cabbage and Radicchio? Red cabbage on left; radicchio on right. Red cabbage and radicchio may resemble one another, but when it comes to flavor, they're as different as traditional broccoli and bitter broccoli rabe. So what is the difference between radicchio and red cabbage? Radicchio (pronounced ra-DEEK-ee-o) is a leafy member of the chicory family, often called Italian chicory, which explains its bold, bitter flavor. Although it's compact like red cabbage, radicchio's leaves are thinner and more tender unlike red cabbage's firm and waxy texture. Red Cabbage is a variety of cabbage with reddish purple leaves. It's flavor and texture is similar to green cabbage. Radicchio is burgundy-red with white streaks. It's light when you hold it in your hand and soft to the touch. The price ranges from $3-6 a pound. Red Cabbage is actually more purple than red and is uniform in color. It's heavy, firm, and has a waxy finish. The price is typically under $1 per pound. Both have their places in the kitchen, but just remember, they are not interchangeable. Red cabbage is best in slaws or simply slow-cooked and served with pork or beef. Radicchio is wonderful raw in salads, grilled and used as pizza topping or sauteed and tossed with pasta. When when you want a bold Italian salad, you've got to go with radicchio. Due to its bitterness, radicchio pairs best with sweet, salty and acidic ingredients such as oranges, prosciutto and balsamic vinegar. That's why this early spring Radicchio and Orange Salad with Citrus-Champagne Vinaigrette, is so pleasing. So next time you're at the market, don't let the cashier guilt you into buying red cabbage instead of radicchio. Just smile, pay the price, then reward yourself with an unforgettable radicchio dish when you get home. 1. 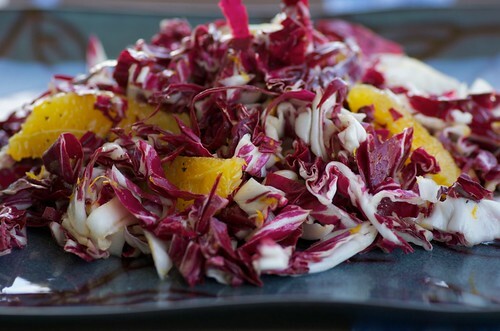 In a large bowl, toss radicchio and oranges. 2. In a small bowl, whisk vinaigrette ingredients. Pour over salad, and toss well. Taste it, and adjust seasonings as desired. Let sit for 20-30 minutes before serving so the radicchio becomes infused with the vinaigrette. *Add thinly sliced fennel bulb and toasted pine nuts. *Add crispy pan-seared prosciutto and toasted walnuts. *Add sliced or shredded cooked chicken and crumbled blue cheese. Now I wonder if I've sometimes cooked radicchio masquerading as red cabbage! Great tips - and I'm willing to make the investment to get a taste of your wonderful salad recipe! I always find it so funny and weird that grocery cashiers (especially those at Whole Foods!) know so little about produce. But thanks for clearing it up! I love radicchio's bitterness and the ingredients in this salad sound like they compliment it perfectly! Interesting story, Susan. I would not have thought it possible to mistake radicchio for red cabbage. It is clear that she never tasted radicchio. Not to berate red cabbage, but there is no comparison. They are both beautiful. Love the colors! Wow, you are one honest lady, Susan! :-) It hadn't occurred to me there was a difference, I haven't bought either too often. Very glad to know now! I love this post, Susan! I've never been brave enough to use radicchio solo in a salad (always tossing in other milder lettuces), but I love how this recipe lets it stand on its own and shine. Although, I'm already dreaming of something involving warm goat cheese alongside...goat cheese grilled cheese sandwich? Thank you so much for the info! I've had both, and like both. While reading your post, I was wondering what the difference between the two was nutritionally. So I looked it up - I was REALLY surprised by what I found! The site nutritiondata.self.com (the best) has the nutritional values of both for 1 cup serving size, raw. 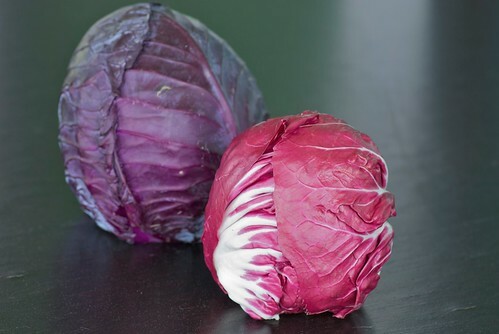 Red cabbage has 19 more calories, both have no fat, and both have 1g protein. Red cabbage also has 15g more sodium. But red cabbage has all the vitamins! While radicchio has 0% vit A, 5% vit C, 1% calcium and 1% iron, red cabbage has 20% A, 85% C (!! ), and 4% calcium and iron. I couldn't believe it! I'm impressed by your integrity. This happened to me once and I did not say anything to the cashier. TW-Ha! I'm sure you haven't. You're too savvy of a shopper. simona-I agree. I'm sure she has never tasted it since, as you say, the flavors are markedly different. teachercooks-I'm not sure your school kids will love it since it's bitter. But I hope you try it soon. Great post on the difference between the two, though I can't actually imagine confusing them (taste-wise, anyways). That salad is so colorful and fresh. I rarely ever buy radicchio unless it's for a special salad I"m making. I guess that's why I don't remember how expensive it is! Maybe I should put off buyingit again until the outdoor farmer's markets season hits and I start seeing it there? Then I wouldn't be able to try your lovely salad though! A great read I really enjoyed this. I guess it could have been worse like cauliflower and broccoli? Geez. How fortuitous! My toddler son picked up a radicchio and insisted he wanted it - he meant for the red cabbage. I've been scratching my head thinking of how to prepre it. Will give this a try! Thank you, Susan. Beautiful photos. Not too much of a radicchio fan but I use red cabbage in slaws. Most of the raddichio I have tasted is awfully bitter. Great anecdote! I love those pictures and the recipe looks wonderful! joey-Aw, that's too bad. You're missing out. domenica-Nope. It's not nearly as well known as it should be. Though I guess it's better for you and me, right? cookincanuck-That's just it. I don't think many people have ever even tasted it. sdoc-It's not too common at our farmers' markets, but if you can get it locally and seasonally, then I'm sure you'll save some money. ricekernel-He's a budding foodie! yay! liz-I grew up on the flavor, so I love its bitterness. But it's not for everyone. cwhim-Oh, you're most welcome. Hope your site is up soon! Great post and love the salad, great for Spring!